LOLTHULHU » O HAI. I HAZ FATHUR… U HIM? 4 Responses to O HAI. 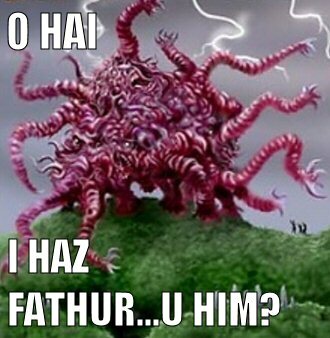 I HAZ FATHUR... U HIM? This one made me laugh more than any of the other ones. Gotta love the Dunwich horror. I don’t know about your fathur, however yur brother is Dean Stockwell.